At this time of year my garden is visited mostly by chickadees, nuthatches and goldfinches. They will spend the winter here and I’m doing them a big favor by not cutting back brown foliage containing nutrient-rich seed heads. Some of the reliable seed producers that I won’t have to clean up this weekend include artemisia, aster, coreopsis, penstemon, sedum, lupine, salvia, black-eye Susan, coneflower, phlomis, monarda, agapanthus and grasses. Hummingbirds still need a nectar source at this time of year. Anna’s hummingbirds live in this area all year long. So In addition to the plants in my garden that supply nectar I keep my feeders up year-round and keep them clean. They need your nectar even more in the winter when very little is in bloom. In addition to nectar rich natives like mahonia, my abutilons are a winter favorite for them. Other tasks I can put off at least for this weekend include planting wildflower seeds. I see California poppies coming up all over the place. Nature knows when the time is right. Well, maybe I’ll broadcast a few working them into the soil very lightly. I need to hoe off some early weeds that would compete with them. How many calories aren’t burned in light gardening? I might just reconsider not being a total couch potato this weekend. Early on one of those freezing mornings I came across a large stand of California native toyon shrubs, every branch covered with juicy red berries. Dozens of songbirds were enjoying the feast loading up and bracing for another cold night. You couldn’t ask for a more Christmas-y plant. Bright red and green- the Christmas colors. I made a note to put toyon on my list for gift ideas. What would be better than to give my loved ones something that feeds the birds and the spirit? 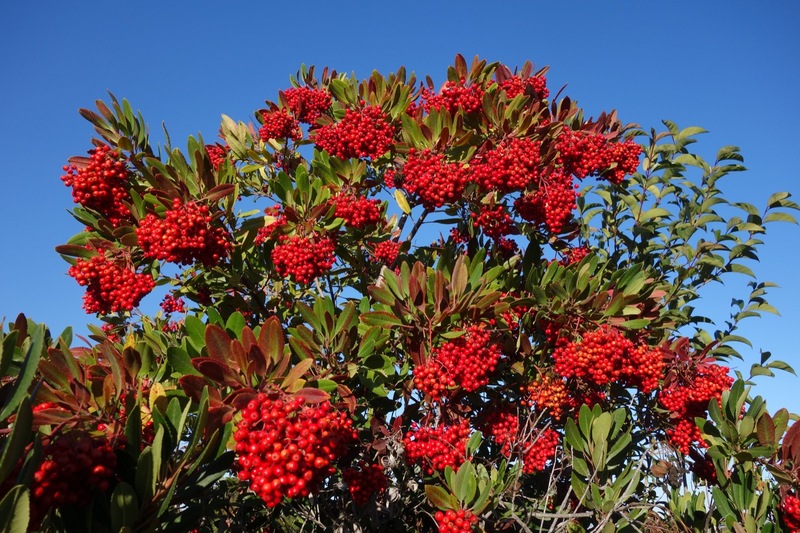 Toyon is a hardy shrub in our area no matter how low the temps drop. Many of the plants in your garden may not be so lucky after the multiple nights of freezing weather we recently experienced. 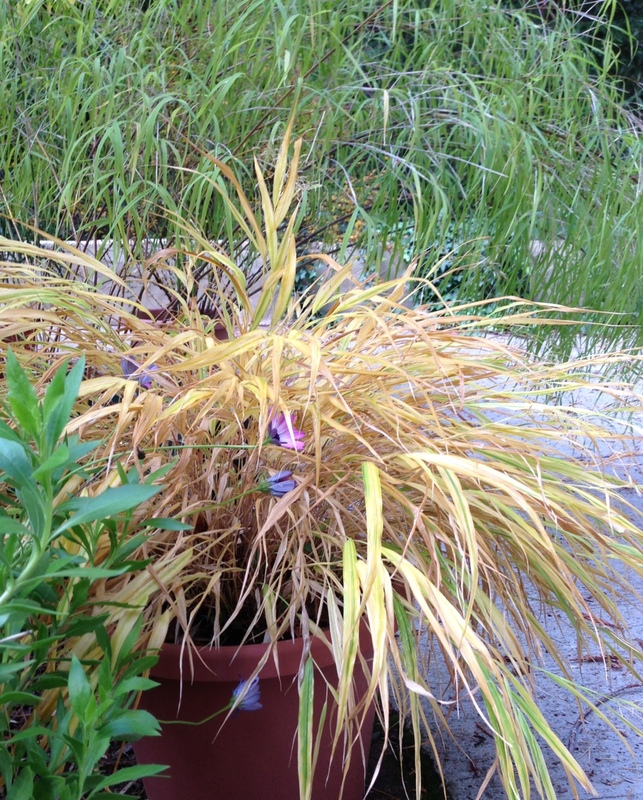 Even if you covered sensitive plants a hard frost can nip plants that normally would be fine in a light frost. Here’s how to deal with frost damage. Don’t be tempted to rush out and prune away the damaged parts of plants. This winter will have more cold weather and the upper part of your plant, even if damaged, can protect the crown from further freezing and provide protection for tender new buds and shoots coming along for next year. This applies to citrus trees, too. If a perennial like Mexican sage froze to a gooey, black mess, cut the plant down to the ground. It will re-grow come spring from the root system. Remember If you have plants that need covering in another frost later this winter, use a frost blanket, light towel, sheets, burlap or other type of cloth and not plastic. The cold will go right through plastic and damage the plant. Getting back to my Christmas list, everybody loves color in the winter garden. Besides toyon berries to feed the birds and other wildlife, Strawberry trees have fruit for much of the winter as do crabapples, beautyberry, pyracantha and nandina if the robins don’t get them first. 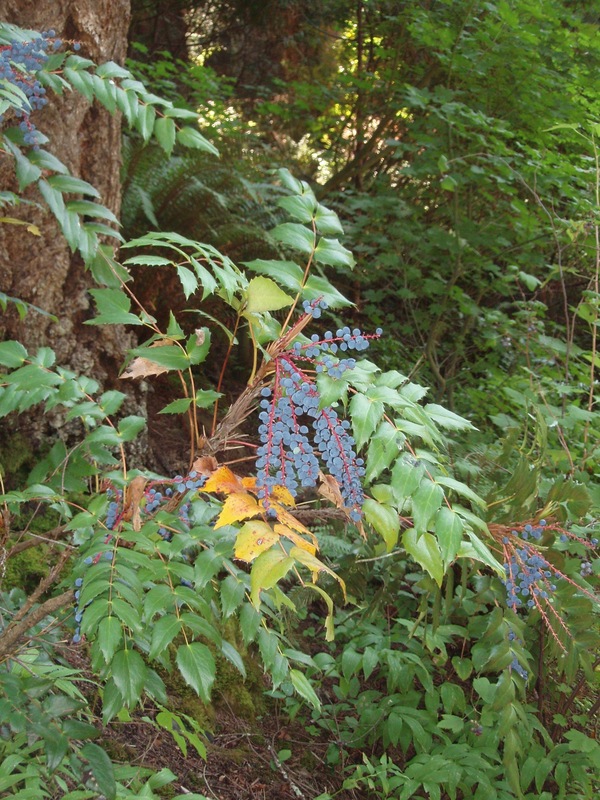 Mahonia or Oregon grape will be blooming soon and their yellow flowers would look great with golden Iceland poppies. Many of their leaves are purplish or bronze now that the nights have gotten cold and are very colorful. Hummingbirds favor their flowers and many songbirds eat the delicious berries. For those really dark places, fragrant sarcococca is perfect combined with red primroses and will be blooming very soon. You can smell their perfume from a long distance. Hellebores bloom in the winter, too, and offer texture in your containers. A variegated osmanthus will hold up in even our harshest weather and would be a show stopper in a Chinese red container. If the idea of sitting under a beautiful shade tree in the summer would appeal to the gardener on your list, you might consider giving them a Paul’s Scarlet Hawthorn that’s covered in masses of rosy blossoms in the spring and colorful berries in the winter. October Glory Maple is a great tree for shade and gorgeous fall color. 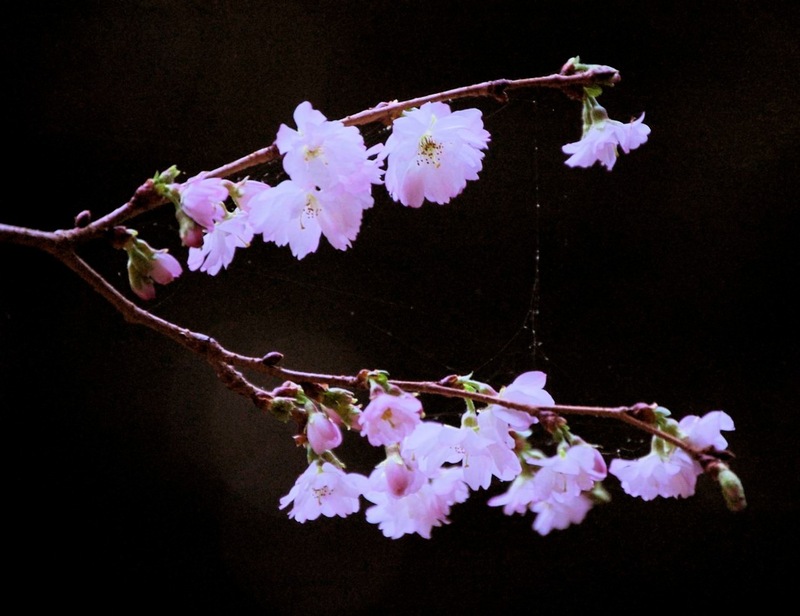 Autumnalis Flowering Cherry blooms twice a year giving you double the show. Mine is in the middle of its fall blooming cycle right now. It’s a welcome sight. A smaller Southern Magnolia like ‘Little Gem‘ with huge fragrant white flowers would also make a nice gift. These are just a few of the shade and ornamental trees that would make a valuable addition to any landscape. Visit a nursery to look for those plants with berries and winter color for other gift ideas. Blueberries, the wonder food: a powerhouse of nutrition and antioxidants. Kids and adults alike love them fresh off the plant, on cereal, in desserts. And blueberry plants are beautiful in the garden. I often design these highly ornamental shrubs into a garden to provide edibles in the landscape that serve both as a fun food to nibble as you walk in the garden and to provide a colorful accent in the fall when the foliage turns fiery red, orange and yellow. Under the branches of a large shade tree at UCSC Farm & Garden, I met with fellow blueberry enthusiasts for a workshop recently to learn from the experts how to grow blueberries in the home garden. 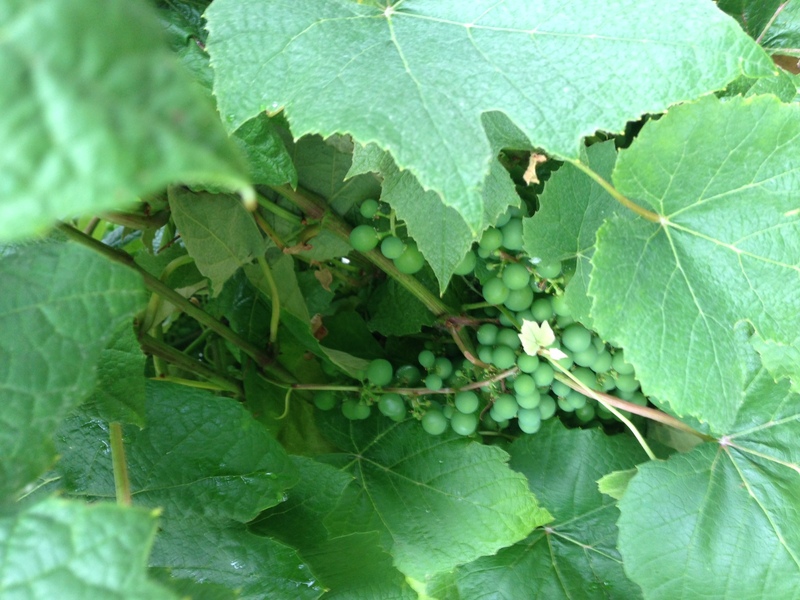 Liz Milazzo, field production manager, shared her personal top 8 varieties. She also told us how to choose varieties for different locales and growing conditions, how to select an appropriate planting location, prepare the planting hole or container, create soil conditions that blueberries need to thrive, how to pruning correctly and care for your blueberry plants to keep them productive. 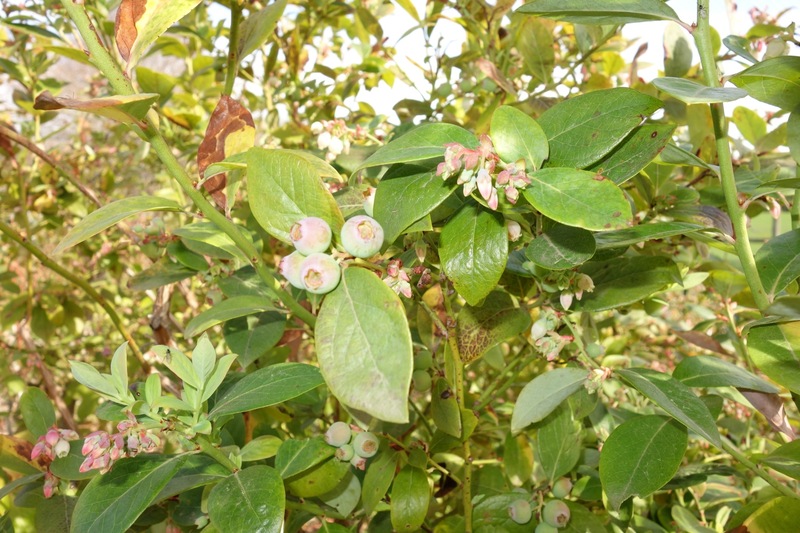 UCSC Farm & Garden grows 1/10th of an acre of different kinds of blueberries. As we walked between the rows of plants for the pruning demonstration I noticed many of them still had leaves and almost ripened blueberries. Liz explained that these berries were set last November and although they are ripening slowly their taste will be inferior. The best tasting berries will come from flowers set in March. You can choose early and late ripening blueberry varieties to extend your harvest. Berry size and overall yield are more important to commercial growers as are varieties that set in clusters making it easier for them to harvest. 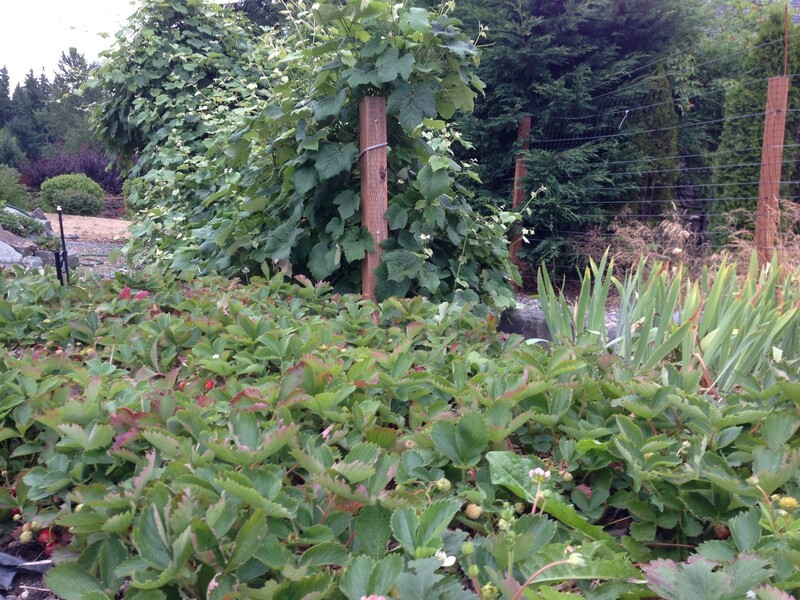 For the home gardening, taste is what we are looking for and it's easy for us to pick a berry here and another there as they ripen to perfection. So what are the top picks of the Farm manager? Drumroll, please. Her #1 pick for the Santa Cruz area is Southmoon. 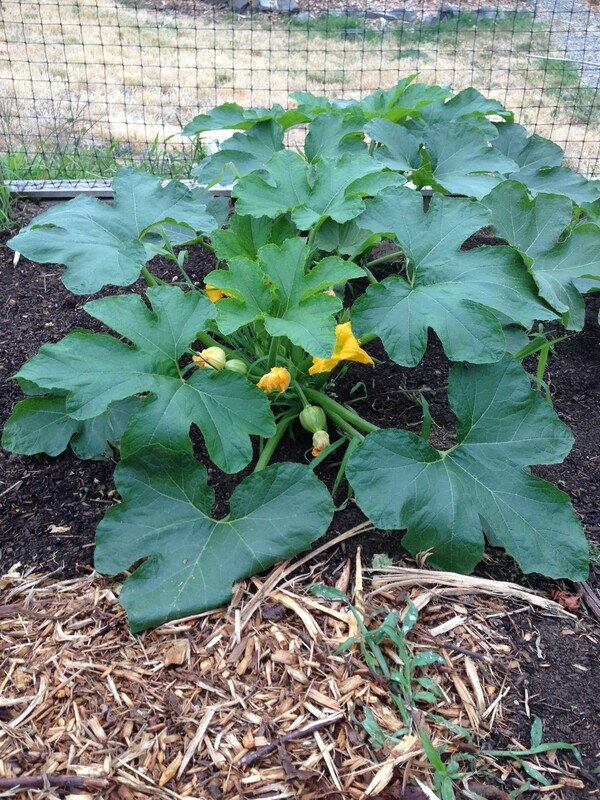 This variety produces early, mid and late season and is a nice blend of acid and sweet. Coming in at #2 is Jubilee, an upright shrub with sky blue berries. Liz also likes other southern highbush varieties such as O'Neill, Santa Fe, Sapphire, Windsor, Jewel and Misty. Some of these are tall woody plants while others are more spreading. For containers, a tall variety like Windsor or Jewel would not work as well as a medium sized bush with an arching form such as Misty, Southmoon or Jubilee. Blueberries need 6 hours of sun or more, regular watering and lots of mulch over their roots. They naturally grow in bogs. The year before the Farm planted their blueberry field, the pH of the soil was 6. Blueberries prefer more acidic conditions so after having their soil tested they tilled in redwood mulch and soil sulfur at the recommended rate. Striving to keep the soil at 4.5 – 5.5 pH they renew the mulch yearly in the fall and add vinegar to the water each time they irrigate to acidify the soil. The Farm uses a commercial grade vinegar but the home gardening can use inexpensive white vinegar at a rate of 1 tablespoon/gallon of water. Liz explained that this will bring city water down to a pH of 5 and blueberries love it. The Farm irrigates the blueberries 2-3 times per week with 1/2 gallon per hour emitters on a drip line every 12". They place 2-3 emitters per plant. Because blueberries require acidic soil rich in organic matter an easy way to supply this is to buy rhododendron and camellia ready made organic soil and use it in containers or to amend native soil 50%. Renewable and sustainable soil amendments include cottonseed meal, feather meal and mustard meal which comes from crushed mustard seed. Pescadero Gold available at Mountain Feed is a good source for mustard meal. A 3-4" layer of mulch over the roots is especially important as blueberries have shallow roots close to the surface of the soil. They don't have root hairs like other plants and depend on mycorrhizal fungi to absorb nutrients. Protect this active zone with a mulch of organic woody material such as wood chips, redwood compost, clean sawdust, pine bark, pine or redwood needles. Blueberries deserve a little extra attention to their growing conditions. They repay you with scrumptious, nutritious berries.